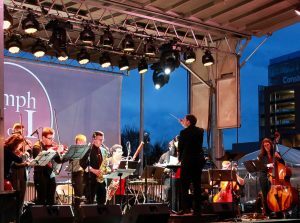 Symphony Number One performs at Light City Baltimore, April 2, 2016. World Premiere: April 2, 2016. Symphony Number One at Light City Baltimore. Michelle Rofrano, conductor. Symphony Number One rehearsal, March 31, 2016. Passing in the Night is comprised of two simple musical ideas moving in opposite directions. The first is a slow-moving melody gradually rising in pitch. The second is relentlessly pulsing percussion gradually falling in pitch. This idea called to my mind the common saying of “two ships passing in the night” referring to two people who spend a brief period of time together, only to separate again forever.